MORONI, Comoros -- Malaria kills more than half a million people every year, and in the Comoros, a tiny island nation off Africa's east coast, it's been a constant fear. In some villages here, 90 percent of people carried the disease. 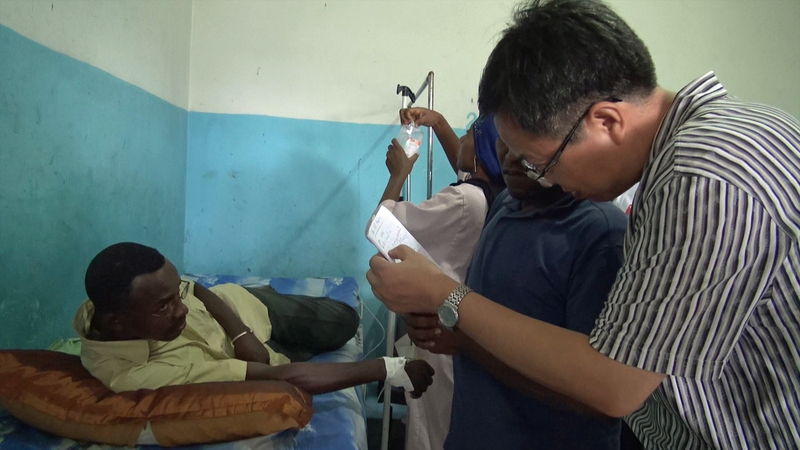 But a team of Chinese scientists, partnered with the Comoran government, say they've wiped malaria off the islands with a new, Chinese-made drug given to everyone in the country in a massive, controversial medical experiment. More than 700,000 people were given three doses of Artequick -- a new combination of anti-malaria drugs which has not been approved for use in humans by any international health body. The scientists behind the project say malaria has been eliminated in the Comoros, and they're setting their sights much wider. "The vision is to contribute to the elimination of malaria in the world," Pan Longhua, General Manager of Artequick's maker, Artepharm Co. Ltd., tells CBS News. The Chinese scientists say they were studying Artequick's side effects, toxicity and the feasibility of getting literally a whole country to take the medication all at once; the only way the experiment can work as designed. It is not only a test of a new drug, but a test of an entirely new method of fighting malaria; three administrations of a drug over the course of three months to a large, isolated population, with the goal of completely eliminating the malaria parasite from the human bloodstream. The scientists argue this method will be more effective than the Western method, which is focused on killing mosquitoes. "We cannot kill all of the mosquitoes," explains scientist Song Jianping, a professor at Guangzhou University of Chinese Medicine. "So we changed the idea. Maybe we can kill all the parasites in the people." The theory was that repeated doses of Artequick would eliminate the malaria parasite from the whole Comoran human population's bloodstream for three months. That is the life-cycle of the mosquitoes which transmit the disease from person to person, so with no human hosts left to carry the disease, the bugs should no longer able to spread it, and it disappears. "The Comoros model of elimination will be useful and will be a model for other African countries," Song tells us in the Comoran capital. Half the people in the Comoros live on less than $1.25 per day. Average life expectancy is just 60 years, and since its independence in 1975, the Comoran government has suffered 20 coups or attempted coups. Fouad Mhadji, the Vice President and Minister of Health of the Comoros, tells CBS News that China's mass drug experiment is bringing free medicine to his people, saving his government $11 million every year in health care costs, and providing economic benefits that will help stabilize the country. But the new combination of drugs used to formulate Artequick remains untested and unapproved by the global healthcare community, and there are concerns about testing it on so many people all at once. "This is a new medicine, and it has not been studied a lot and it is not widely available, says Andrea Bosman of the World Health Organization's Global Malaria Program. "This is new. This is very new." But Artepharm, the drug's maker, is already citing the experiment in the Comoros as proof of the drug's effectiveness. The company is marketing the drug throughout Africa, advertising Artequick as a malaria treatment with a longer shelf-life, fewer side effects, a shorter regimen and lower cost than other options on the market. All of which makes it a "very promising" drug to treat the disease, according to company boss Pan Longhua. The World Health Organization doesn't dispute the claim from the Chinese scientists and the Comoran government that malaria has all but vanished on the islands since the Artequick "mass drug administration." But while the scientists behind the project said only 1 percent of the population should experience side effects from Artequick, many people CBS News spoke to in the country reported serious ones. Local hospital officials wouldn't blame the drug openly when speaking to us, but they say their patient intake doubled the week after the first administration. The Comoros government blames the seasonal flu for the surge in hospital admissions. Bosman, of the WHO's Global Malaria Program, is critical of how the Chinese experiment's managers are handling reported side effects from Artequick. He says neither the scientists running the experiment nor the Comoran government have monitored side effects in a systematic way. That, in Bosman's view, not only risks harming the participating Comorans, it is also a missed opportunity to learn lessons from the project that might have helped other countries in the fight against malaria. "You should probably monitor the population closely when doing these mass drug administrations, and this is very difficult. It's not an easy task. As far as we know, this is not being done during this mass drug administration," Bosman tells CBS News. "As far as I know, they are looking at the clinics where the drug is being given and asking if there is increased reporting of side effects, but it is very insensitive. This approach is very crude," adds the WHO official. Few locals told us they were warned of any side effects before taking Artequick. Villagers were also not informed about the risks of Primaquine, a powerful anti-malaria medicine the scientists use in combination with Artequick for this experiment. Primaquine can be lethal -- causing red blood cells to rupture -- but chief scientist Song Jianping says his team is using it at low, safe levels. Ahead of the second administration, scientists tried to give people more information. We went with Chinese researchers and local doctors to meetings across the island where villagers voiced their confusion and fear of the drug. "Our main concern is that just a few hours after people took the drug, they got sick, and there were economic effects. Some people spent 30,000 Comoran francs for treatment at the hospital after taking the malaria medicine," said a local man at one meeting, adding, to applause from his peers: "We are poor! We are hungry! Give us rice not a drug." "This drug is safe and effective," a local doctor shouted through a megaphone, "Some of you think you are being used as guinea pigs. You are not being used as guinea pigs. The WHO would not allow this administration to happen if you were being used as guinea pigs." There could also be severe, unintended consequences just a few years down the road. Dr. Yao Kassankogno, the WHO representative in the Comoros, fears China's mass drug administration will rob the population of its built-up immunity to malaria, creating conditions for an epidemic if the disease is ever re-introduced to the islands. "After two or three years, if they lose (natural immunity), and the parasite comes back, everyone looks like new, and there will be more severe cases," he tells CBS News, adding that other countries have seen epidemics of a similar nature. Kassankogno says that means more people could be killed by a resurgence of malaria in the Comoros in the future thanks to China's mass drug administration. Song Jianping, the chief project scientist and a president at the company which manufactures Artequick, says his team trained 200 Comorans to monitor malaria rates in the future in an effort to prevent the parasite from returning to the islands. Kassankogno worries, however, that the Comoran government's ability to monitor malaria in the country is simply not up to par. Critics also say administering a malaria drug to such a large population could build up resistance to Artemesinin, one of the key ingredients in Artequick and one of the most widely-depended upon treatments for malaria in the world today. Vice President Mhadji dismisses that criticism of the mass drug administration as propaganda fueled by Western rivals to the Chinese drug's maker. "For me as a politician," he says, "I think it is a problem of market between the Chinese part, and maybe Novartis." The vice president's reference is to Coartem, another Artemesinin-based Combination Therapy, or ACT, made by Dutch company Novartis, which would be a market competitor to Artequick. "Why is Artequick bad? It is because it is sold by China," argues Mhadji. Among the Comorans CBS News met during the experiment, opinion was divided. Hadia Ali, a school teacher who said she had to take time off work due to side effects after taking Artequick, still fears the drug. But right her next door, her neighbor Chamsati Assani is hopeful that it can safeguard her son's future. "As a mom, malaria is a constant fear. When my baby looks tired, does not want to eat, or behaves strangely, I worry it is malaria. The disease is a nightmare in our lives, especially because I don't have money to take my child to the hospital," she tells us near her home in the capital. "We pray to God that this drug will work, because times are hard and malaria is affecting our families more and more." It will be months, or even years, before Chamsati and other people at risk of malaria around the world can be confident that the Chinese have created a real, safe, and lasting cure for the deadly disease.